House Specialty: Koobideh kebab served hot off the grill at Kabab House. TO the victor, go the spoils of war. And one of those spoils is the food. Countries that invade other countries in turn become a magnet for immigration from those same countries, and these new immigrants bring their recipes with them. For example, thanks to the British Empire's imperial exploits in India, chicken vindaloo is available everywhere in London. Amsterdam's ready supply of gado gado is due in large part to Holland's colonial occupation of Indonesia. The United States offers the best example of this culinary-imperialist blowback. Once a country has been fully subdued by 500-pound bombs and U.S. agents of "democratization," inhabitants tend to flee in droves and inevitably—and somewhat ironically—head for the shores of the country that did them in. Notice how immigration from countries like Vietnam, the Philippines, El Salvador, Guatemala and Iran spiked upward following U.S. invasions/coups/interventions. Mexico is a special case. They've always been here. Because we share a border with Mexico and much of the Southwestern United States was Mexico before it was captured in the Mexican-American War, Mexican immigration to the United States, legal and illegal, is just plain natural. As a result, Mexican food is as "American" as, say, hot dogs and apple pie. Of course, given its wealth and power, the United States has always been a destination for those seeking a better life. Whether we meddle in other nations' affairs or not, immigrants will still come here because of the economic opportunity and sanctuary from violence that America offers. War and foreign intervention just increase the rates of immigration. Which leads me to wonder: Are we going to start seeing more Iraqi restaurants? Although Iraq is the cradle of civilization, it's not known for its food. At least not yet. Maybe returning GIs will create a demand for Iraqi food. There are only a few Iraqi-owned restaurants in Silicon Valley, and most of them serve familiar Middle Eastern fare like falafels, kebabs and hummus instead of Iraqi food. Santa Clara's Kabab House Halal, a spare, eight-table restaurant, serves a pan-Middle Eastern menu that leans toward Iran. I told owner and Baghdad expat Wajdi Hinosh I wanted try some Iraqi food, but he said it's not very good. I think he was joking because he does make a few dishes from his homeland. Although it probably doesn't have the appeal of a good falafel, he serves okra and rice on Fridays, a special Iraqi dish. As the name implies, Kabab House is basically a kebab house and serves good koobideh ($7.50, seasoned ground beef), chicken ($8.50) and barg (chunks of beef) kebabs. The kebabs are cooked on a long, rectangular grill directly over the burning coals. The koobideh is best, but I liked the chicken, too. The tender, orange-tinted meat reminds me of tandoori chicken. The restaurant serves a lunch buffet that's a great value. For $8.50 you get a choice two kinds of kebabs, ghormeh sabzi (an Iraqi version of the dark green Persian herby stew) and excellent basmati rice. All-you-can-drink hot tea is part of the deal, too. Be sure to try some of the restaurant's excellent naan. Hinosh makes it all day long and it's great right out of the tandoori oven, puffed up like a big, steaming pillow. San Jose's shiny clean Palms Restaurant is another outpost of Iraqi cooking. Owner George Silyou is an Assyrian from northern Iraq who worked as a mechanic and a restaurant owner. He moved to the United States in 1991 and worked as a piece-rate tailor at home. Silyou is a friendly, social man and he tired of working at home, so he opened his restaurant 10 months ago. Like Kabab House, Palms Restaurant serves familiar Middle Eastern dishes because that's what he says people want. The only Iraqi item on the menu is the beef shawerma sandwich ($5.99). Shawerma, vertically roasted and sliced beef, is not unique to Iraq, but Silyou says the easy-on-the-spices preparation makes it an Iraqi dish. 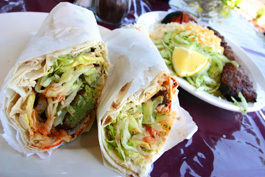 (If you want to impress Silyou, ask for a "gus" sandwich, the Iraqi term for shawerma). Encouraged by the demand for his shawerma sandwiches, Silyou plans to add more Iraqi dishes. I hope cubba, egg-size balls of fried bulgur wheat filled with ground beef, make it on the menu. He gave me a taste of one and they're great—like a crisp piroshki, only better. For local Iraqis in the know, the restaurant will prepare paga, a festive dish of lamb's intestines stuffed with lamb tongue, ground beef, rice, garlic and other spices. The haggislike dish is cooked with rice, garbanzo beans and other ingredients into a grand stew that is popular for takeout during the winter for holiday celebrations. Until more Iraqis move here and open restaurants, these two eateries offer a little taste of what's to come. I think Silicon Valley is ready for more Iraqi food, but it's probably best for restaurateurs to start off with shawerma and cubba before putting stuffed lamb's intestines on the menu. Kabab House Halal. Address: 2521 Newhall St., Santa Clara. Phone: 408.984.2204. Hours: 11am-10pm Tue-Sun. Price Range: $2.99-$10.50. Palms Restaurant. Address: 2707 Union Ave., San Jose. Phone: 408.963.2001. Hours: 10am-9pm Mon-Thu, 10am-10pm Fri-Sat and 10am-9pm Sun. Price Range: $4.99-$9.95.